The Phobya PCIe x1 to x16 riser card is the ideal solution for building a mining system. With the PCIe x1 slot on one side and the x16 slot on the other, it’s easy to run more than the usual 2, 3, or 4 graphics cards on one motherboard. Some special mining motherboards can be set up with more than 12 graphics cards. In these cases, a corresponding riser card is absolutely necessary, as the slots on the motherboard are too close to each other to connect the graphics cards directly. The Phobya PCIe x1 to x16 riser card also features a separate SATA power connection. This is used to ensure a stable power supply to the graphics cards. According to JEDEC specifications, the PCIe x16 slot must be able to provide 75W. 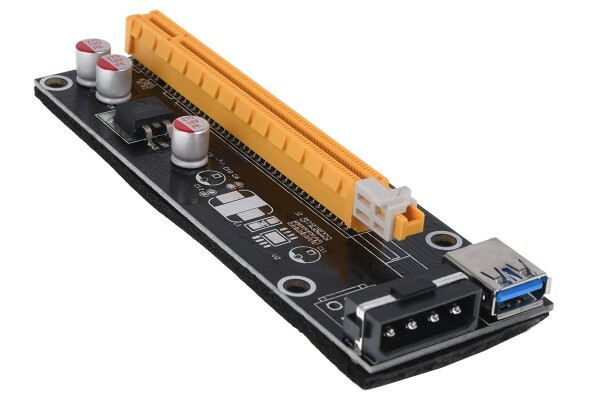 The PCIe 1x card is connected to the PCIe x16 card with a USB 3.0 cable that is especially long at 60cm. The PCIe x16 card has four screw holes for mounting in the desired place. The holes are 9.5 and 3.5cm apart, measured through the centre. On the backside of the card is a foam cover intended to prevent an accidental short-circuit. Note: The colours of the card and the cable may vary from the display picture.